Troubles for American Andrew Yoder - he limped into transition out of the water which was we assume was cramp. 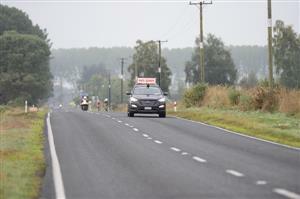 He got out on the bike but 6 minutes down but he has not made the turn at Reporoa. Gina Crawford has finally come through 46km on the bike. The Wanganui-based athlete is some 5:44 down on Kessler. At the 50km mark, O'Grady has extended his advantage on Skipworth to 27 seconds. Meanwhile, Terenzo Bozzone looms ever closer. 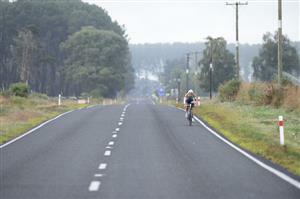 The three-time podium finisher at IRONMAN NZ is now just 43 seconds back on the leader. Exactly one minute down on O'Grady is Christchurch's Dylan McNeice with pre-race favourite and number one seed Cameron Brown in fifth 2:31 back. In the women's elite race Meredith Kessler has gone through 50km. Andrew Yoder of the USA has climbed off the bike and officially quit the men's elite race. At the 50km mark Kessler's advantage over Gina Crawford now sits at 6:05. Early days, but we could be set for a Kessler-Crawford one-two finish for the third successive year. As an additional incentive 50 spots are available today for age-groupers at the 2015 IRONMAN World Championships. An update from the 46km mark on the bike in the women's elite race. Stephanie Jones of the US passed this mark 16:00 down on Kessler in third. Jocelyn McCauley also of the US was fourth in 18:12 with Kiwi Melanie Burke, an ex-international cyclist, in fifth 19:47 down. The rain has now stopped and conditions now best described as overcast. The next split on the bike will be fascinating, particularly with Bozzone and Brown the top two seeds in the men's elite race beginning to take a much closer order. Significant update in the men's race as Terenzo Bozzone leads Graham O'Grady by 27 seconds at 75km. Meanwhile, up to third is Cameron Brown 1:42 back. Some 2:05 down are Skipworth and McNeice. A little way down on the halfway point New Zealand holds the provisional three podium positions. Aussie Alex Reithmeier holds sixth at 75km on the bike 4:05 adrift. Next likely split for the men's elite race to come at 88.5km. Kiwis James Cotter and James Bowstead are 5:52 and 5:57 down on Bozzone at 75km in seventh and eighth, respectively. Race leader Terenzo Bozzone through 88.5km mark on the bike. Bozzone's advantage is 57 seconds from O'Grady with Cameron Brown passing 88.5 mark 2:08 down on his long-time Kiwi rival. Dylan McNeice is fourth (3:00) with Todd Skipworth (3:08) in fifth. Alex Reithmeier rounds out the top six 4:53 back on the Bozzone. The leaders are setting a blistering pace. A long way to go, but the course record of Bevan Docherty may be vulnerable. It stands at 8:15:34. Bozzone is already on a pace to beat Docherty's mark set in 2013. Remember, Bozzone on top form following a controversial race win in Dubai last week. 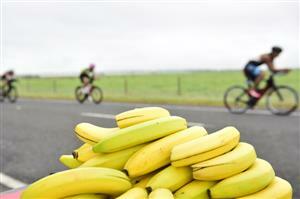 IRONMAN NZ is a truly global event. There are competitors here from 52 countries from Brunei to Brazil, Dominica to Denmark and Serbia to Sri Lanka. At 100km on the bike Bozzone's lead over O'Grady now sits at 1:01 but perhaps more significantly he took 30 seconds out of Brown in the previous 11.5km. Brown now 2:40 back in third. Dylan McNeice 3:45 down in fourth at 100km with the first non-Kiwi, Todd Skipworth of Australia in fifth in 4:16 down and his countryman Alex Reithmeier sixth (5:46). A quick update on the elite women's race; Crawford at 88.5km trails Kessler by 8:57 with Stephanie Jones (18:27) in third. At this stage of the race Kiwis occupy the first four places in the men's elite race. The last time New Zealand claimed a clean sweep of the IRONMAN NZ podium was in 2010 when Brown beat Bozzone to first with Kieran Doe third. 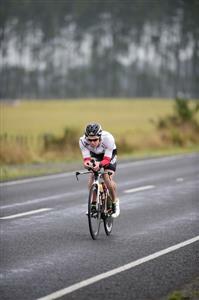 Watch out for leading age grouper Bevan McKinnon (age 40-44). He was the fastest overall age-grouper 12 months ago and he appears to be having a great race figuring prominently on the bike. In the elite women's race, Melanie Burke has nudged up to third at the 138km point.. It is no great surprise the Kiwi is performing well on the bike and she is a former international cyclist. Burke is 20:11 down on Kessler. Jones has been relegated to fourth and is a further 33 seconds down. Exciting stage of the men's elite race as the athletes will soon be expected to come into T2. The lead elite men to hit second transition very shortly. Bozzone held a 2:49 lead from O'Grady at the last split we had at 150km. At the 150km mark on the bike, Crawford is 15:30 down on Kessler. While its looking very good for Kessler the men's race is proving a much more open affair. Brown has built on his early run advantage. At 4km he holds a handy 20-second lead on Bozzone.